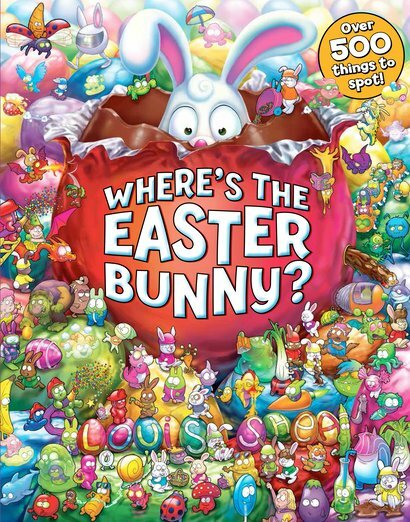 Buy Where's the Easter Bunny? Not just eggs! You’ll spot lollipops, aliens and fairytale critters in your quest to find the Easter Bunny! Daffodils are springing up, baby animals are saying hello to the world and children are busily hunting for chocolate. But one thing is missing from this pretty Easter scene: the Easter Bunny. Where is he? Well – he’s fallen down a rabbit hole into a magical burrow. Oops! Follow his trail through fantasy lands full of wondrous things to spot. Can you help him get home in time to deliver his eggs? Or will hungry Foxy beat you to it? Follow-up to the bestselling Where’s Santa?